Perth Airport is situated approximately 3 miles to the North East of Perth along the A94 just past the village of Scone. You will find the entrance to the Airport on your left if coming from Scone, or on the right if approaching from Couper Angus. There is parking in front of the Control Tower (SCAA Premises), or you may try and get parked near the Scottish Aero Club, however parking at the club is limited at the weekend due to demand, so please consider parking at the Control Tower and proceed on foot. When you drive into the Airport area, after 150 yards there is a mini roundabout. Take a right turn. Drive towards the end of the road towards the Touch Down Cafe. Just before the cafe, there is a narrow lane to your left. Drive up that lane and there is more parking (limited at the weekend). 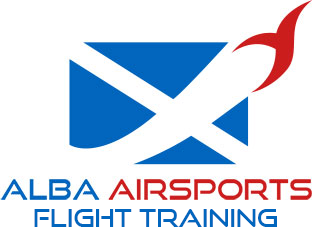 Alba Airsports is situated within the Scottish Aero Club premises, which are to the right of the parking area.